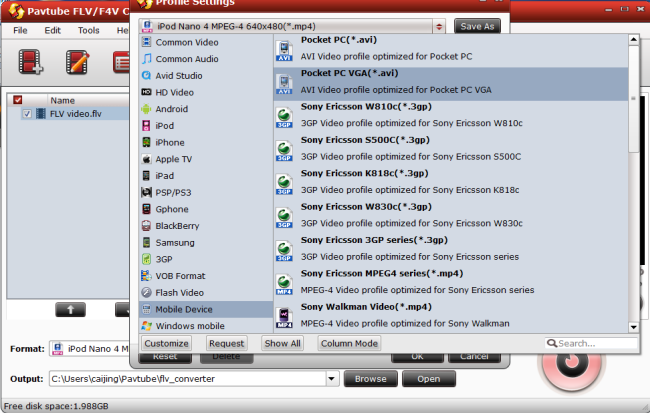 How to convert MTS to MP4? How to Extract Audio from FLV Video to MP3 audio? Pavtube MTS/M2TS Converter is an friendly, stable and powerful tool to help you enjoy high-definisiton MTS/M2TS videos from AVCHD folders or Blu-ray movies anywhere anytime on your iPad, iPhone, iPod, BlackBerry, Nexus One, HTC, etc easily. How to convert FLV to MP3,extract FLV to MP3? To change the output audio parameters, please click on the "Settings" button next to the "Merge into one file" allowing to combine FLV files into a single one with ease. As you see in the above picture, you are able to change audio codec, sample rate, bit rate, and channels with Settings tag. After this, you can click on "Convert" tag and "Start" to FLV to MP3 conversion. Once the FLV to MP3 Conversion is done, you can get the good quality MP3 file from its location and then you can transfer it to your favoriate MP3 player for playing. By the way, batch FLV to MP3 conversion is also supported. FLV (Flash Video) is a proprietary file format used to deliver video over the Internet using Adobe Flash Player 6, Adobe Flash Player 7, Adobe Flash Player 8, Adobe Flash Player 9 or Adobe Flash Player 10. The ubiquity of Adobe Flash Player has made it possible for the FLV you post on the Internet to reach wider audience. MP3 (MPEG Layer-3) is a digital audio compression algorithm that achieves a compression factor of about twelve while preserving the original sound quality. It does this by optimizing the compression according to the range of sound that people can actually hear. MP3 is currently the most powerful algorithm in a series of audio encoding standards developed under the sponsorship of the MPEG organization and formalized by the ISO. MP3 files (filename extension ".mp3" ) can be downloaded from many World-Wide-Web sites and can be played back using software available for most operation systems, for example, Winamp fro PC, MacAmp for Machintosh, and mpeg123 for Unix. PM3 files are usually downloaded completely before playing but streaming MP3 is also possible. A program called a "ripper" can be used to copy a selection from a music CD on to your hard disk and another program called an "encode" can convert it to an MP3 file. How to play flv online?